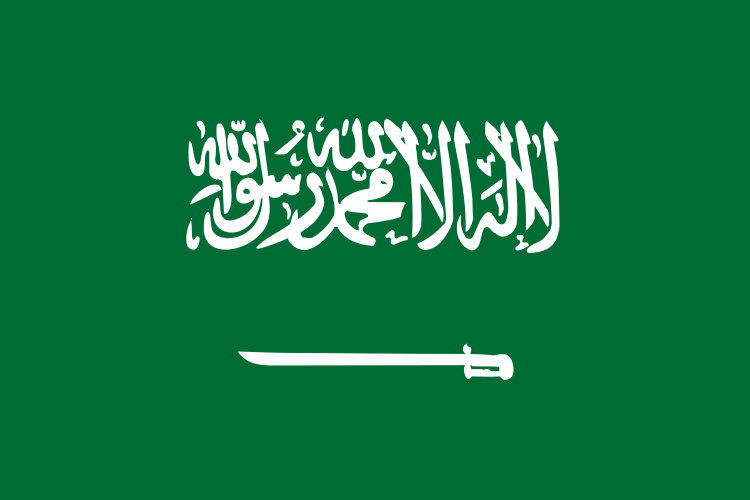 The Flag of Saudi Arabia- Adopted in 1973. Since the founding of the country, Saudi Arabia has always battled with the idea of free speech. The Al Saud family, the family that has ruled the country for generations has succeeded in enforcing their monarchy “through a skillful combination of distribution, penetration, and coercion, with a legitimating dose of ideology.” (Angrist, 2010) According to author, Michele Angrist, “At the end of the day, governance in Saudi Arabia is not representative, not accountable, and does not protect rights for citizens. Basic civil and political rights are absent.” (Angrist, 389) Basic crimes throughout history have been seen including strikes, public criticism, and revolt. In fact, revolt is how the country was taken by the Al Saud dynasty. The Arabs were the ones to revolt against the Turks, leading to the capture of Riyadh, the capital of Saudi Arabia. Abdul Aziz Al Saud helped the British defeat the Turks in 1902. (Arshad, 2003). Saudi Arabia has always had a firm grasp on their citizens when it comes to free expression. Their lack of pluralism can be seen clearly even in today’s time. Historically speaking, free speech has always been in play in Saudi Arabia, and this can be seen clearly by looking at the speeches provided by the past generations of rulers. “Political speech tends to reiterate the themes embedded in historical studies but also contradicts some aspects of this historiography.” (Al-Rasheed, 2010)They focus on Saudi Arabia not only as a society by also as a system of politics born in the modern era. The limitations on free press have been prevalent since the establishment of the country. This is clear by looking at the number of censorship laws put into play by the Saudi government, and their reactions to any sort of protest to the way the country is run currently. In the earlier months of 2011, two petitions were sent out by Saudi intellectuals calling for “an elected parliament with full legislative powers, the independence of the judiciary, greater freedom to establish civil society organizations, guarantees of freedom of expression, the release of political prisoners, and greater efforts to root out official corruption.”(Gause, 2011) Even the Saudi elite seems to be standing for more freedom in expressing themselves. The petitions however were not considered by Saudi rulers, and instead placed more stringent regulations of political speech and arrested a number of activists as they have always done. On February 15, 2012, the International Freedom of Expression Exchange posted an article commenting on the charges of blasphemy and apostasy that a Saudi blogger faced after tweeting about the Prophet Mohammed. The report states “A Saudi blogger whose tweets about the Prophet Mohammed were deemed blasphemous and tantamount to apostasy has been deported from Malaysia back to Saudi Arabia, where he is certain to face trial and possibly the death penalty”. (IFEX,2012) Hamza Kashgari, tweeted on the birthday of the prophet saying “I have loved things about you and I have hated things about you and there is a lot I don’t understand about you,”. A number of tweets followed afterwards stating the journalist’s reluctance to accept Islam in its entirety. Kashgari “led Saudi Arabia on 6 February in hopes of finding political asylum after his tweets sparked an official publishing ban and order for his arrest, as well as a Twitter lynch mob that called for his death, report the members.” Unfortunately, he was caught in Kuala Lumpur on February 9. This case is one amongst the many that clearly depict the censorship issues of the country. (IFEX, 2009). ON Mach 15, 2012 IFEX reported that influential poet Habib Ali al-Maatiq was detained one again by the Saudi government. “He was detained nine years ago for three years because of his reformist political onions. He is detained once again, and Saudi mass media, which is controlled by the Saudi government, remains silent.” (IFEX,2012). Looking at Saudi Arabia, it is apparent that the country has a number of problems dealing with free speech and free press. Freedom of expression is not favored in this society, which is not something most Americans are used to, however according to the World Press Freedom Index, America is not the freest country in the world when it comes to freedom of expression. This is clear with the “Occupy” movements that have been going on for quite some time now. Although America as a nation is freer than Saudi Arabia, we prove to be found ranked at number 47 on the list. Although the number is lower than most would expect, the Untied States is still thought of as a satisfactory situation. The way that America would handle the situations in Saudi Arabia are very different. For example, the protest that was done at King Khaled University would not have led to the death of an innocent as well as dozens injured. In ideal America, one can hope that since this was a peaceful protest, they would be allowed to continue with no consequences. The first amendment explicitly protects this right. Saudi Arabia detains individuals who peacefully assemble. Once again, in ideal America, this would be considered unconstitutional and detainment would not be allowed. The Saudi elite asking for a more modern government through two petitions would have received more interest in America insofar as the voices of the American citizens are usually heard. The three branches of government are equally divided and the appropriate separation of powers that is put on each branch protects citizens’ rights. The Saudi blogger case is interesting. Just recently in the United States, congress was looking to pass the SOPA bill, which was the government’s attempt at trying to prevent piracy and copyright infringement. Citizens met the bill with incredible distaste as many believed in went against their rights provided to them by the government. American citizens were able to do this without having to worry about criminal punishment because of the rights provided to them in the Constitution. If the Saudi blogger were an American who decided to post tweets about his hesitation to believe Islam, it would not be met with detainment and criminal punishment due to the fact that citizens are provided the freedom to speak freely. Rights in America are very different from the rights given to Saudi Arabians regarding free speech and free press. From previous research, it is apparent that Americans have more freedom to say what they want and write what they believe as long as it does not intentionally harm anyone. Saudi Arabians are held under law to only write things and make comments that do not go against the nation of Islam. Even though America is not the freest country of the world when it comes to freedom of expression, they beat out Saudi Arabia by a long shot. Currently, Saudi Arabia is working to modernize their government, regardless of resistance from the rulers, but maybe one day their citizens will be as free as American citizens are. Angrist, Michele. Politics & Society in the Contemporary Middle East. Boulder, CO: Lynne Rienner Publishers Inc, 2010. Print. “Authorities urged to stop arbitrary arrests, travel bans on critics”. Trans. np. IFEX. 28 Mar. 2012. Web. 4 Apr. 2012. ‹http://ifex.org/›. “Blogger faces charges of blasphemy, apostasy after Mohammed Tweets”. Trans. np. IFEX. 15 Feb. 2012. Web. 4 Apr. 2012. ‹http://ifex.org/›. “Crackdowns on Protests Cause Big Changes to Index Positions.” Trans. Reporters Without Borders. Reporters Without Borders. 25 Jan. 2012. Web. 4 Apri. 2012. “Critical Poet Detained; website blocked”. Trans. np. IFEX. 15 Feb. 2012. Web. 4 Apr. 2012. ‹http://ifex.org/›. “Local Content Filtering Policy”. Trans. Internet Services Unit King Abdulaziz for Science and Techonology. nd. Web. 4 Apr. 2012. ‹http://isu.net.sa/›. “Student and demonstrator killed as protests spread”. Trans. np. IFEX. 13 Mar. 2012. Web. 4 Apr. 2012. ‹http://ifex.org/›. Zittrain, Johnathan. “Documentation of Internet Filtering in Saudi Arabia”. Trans. Harvard Law School. Harvard Law. nd. Web. 4 Apr. 2012. ‹http://cyber.law.harvard.edu/›.